Most of us can agree that understanding the Kingdom of heaven, i.e. God’s Supernatural Kingdom, can be difficult, even for adults. If this is true, then certainly children can learn about God’s supernatural kingdom easily when it presented to them in age-appropriate ways. If the Kingdom of Heaven belongs to children, then it is not a stretch to believe that children then can operate supernaturally in that supernatural kingdom. Children can learn about God’s true supernatural power, which is operating in the nine gifts of the Spirit. They need to learn what the Devil has to offer through magic and witchcraft, are simply cheap counterfeits of what God offers. That’s what will happen as you teach these powerful, yet simple lessons to your children. I have said repeatedly since this ministry began, “Kids are hungry for the supernatural.” I constantly preach to anyone who will listen that they are drawn to the supernatural like a moth is drawn to the light. Unfortunately, most of the time they can find the supernatural everywhere except in our churches, where they should be finding the true, glorious, powerful supernatural presence of the living God in an ongoing, life-changing basis. It’s no wonder they are flocking to Harry Potter and similar types of media entertainment! He is filling a deep spiritual need in their heart of hearts! Today’s young people are surrounded on every level with witchcraft, casting spells, magic, and many other elements of the supernatural. By the time they reach their teen years, they are insensitive to to their dangers, and do not consider them contrary to their Christian beliefs. They need to know our God is much more powerful than the enemy. But they seldom realize that when all around them is the seeming power of witchcraft and magic. In these lessons, our primary focus is on the positive power of the Holy Spirit. After weeks of studying God’s supernatural power, we then add in a couple of lessons about the dark side of the supernatural to show that what we have always thought was huge, is actually very insignificant in comparison to the power of God. We lead the children into a desire to experience the true supernatural power of God. That will walk away understanding there is no comparison between the power of the Holy Spirit, and the counterfeit supernatural. It is important, in our current culture, to teach kids what God says about the kingdom of darkness. The majority of Christian children are never taught, and it leaves them vulnerable to the Enemy’s deceptions. Surprisingly, Christian children are seldom taught about the spirit world and don’t realize there is something more than the natural world around us. 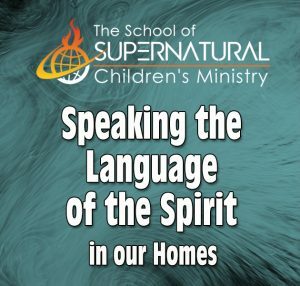 Our kids need to know about the spirit world. We must go to great pains in our teachings to educate them in this by talking about how they’re created in God’s image, how that they are a spirit. When parents, children’s ministers, or church leader deliberately bring children into the presence of God and teach them how to respond, the glory of God fills the atmosphere. Children and teens frequently begin to melt in His tender presence into a heap of emotion and tears. They begin to feel His presence, hear His voice, sense His love. 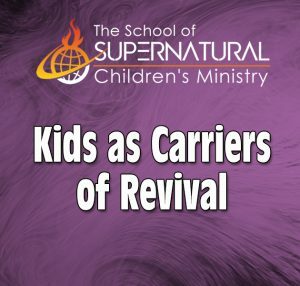 Kids are hungry for the supernatural. It’s here they can distinguish between the real and the counterfeit supernatural. God’s Supernatural Kingdom is one of the most powerful curriculums Becky Fischer has ever written! 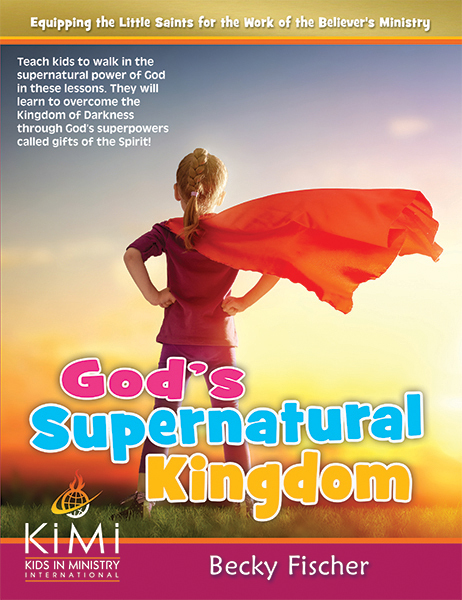 If you liked our curriculum Hearing God’s Voice, you will LOVE God’s Supernatural Kingdom! Our curriculums were written specifically for Pentecostal, Charismatic, and Spirit-Filled churches. Click here to see a FREE sample lesson PDF DOWNLOAD. What’s Included In God’s Supernatural Kingdom curriculum? TESTIMONIAL: Angie Pulsifer, Ontario, Canada, wrote on Facebook: The material in God’s Supernatural Kingdom is powerful and I highly recommend it! The kids we are teaching love the material and they are going much deeper with God! The questions we had this week from 6-12 year olds were very deep! 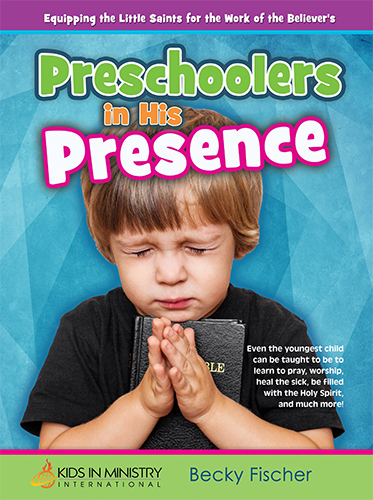 This curriculum is a great tool for taking your kids ministry to deeper levels in God! The kids are very enthusiastic to learn more each week and they are getting the importance of working with God on His plan to bring His Kingdom to earth through us His people! It amazes me how much more God is showing them in their soaking time, after the lesson! We are praising God for the great things He is doing! 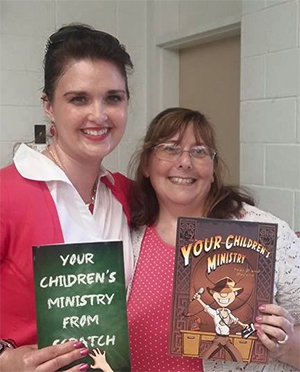 Angie Petersen wrote on Facebook: God’s Supernatural Kingdom is a great series for the kids. They have grown and learned so much as we have worked through it. We took our time going through it and they have had SO MANY questions. It is so wonderful to see how they have entered into praying for others as a normal part of their life. I get reports from parents who are amazed by the insight the kids have into the subjects we covered. Parents have told me how when their kids hear that someone needs prayer about something, they immediately jump in and pray too! We have people who come into Healing Rooms just to have the kids pray for them! Jesus and His Kingdom of Light have become such a real part of their lives! My church has all of Becky’s material. You can not go wrong with any of it! But I had to grab this one when it first came out! I was not disappointed! It’s fantastic! You can feel Holy Spirit moving from the very first lesson til the last! The kids really respond to it and I have seen fruit manifested in them. My kids are teaching now on Wednesday nights. They have matured spiritually. Buy this! You will not regret it! Thank you Becky for inspiring me! Thank you for listening to Holy Spirit and writing this wonderful curriculum! God Bless you and your ministry! 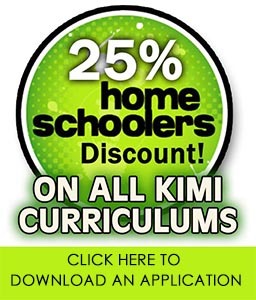 Angie Pulsifer, Ontario, Canada, on Facebook wrote: The material in this curriculum is powerful and I highly recommend it! The kids we are teaching love the material and they are going much deeper with God! The questions we had this week from 6-12 year olds were very deep! This curriculum is a great tool for taking your kids ministry to deeper levels in God! The kids are very enthusiastic to learn more each week and they are getting the importance of working with God on His plan to bring His Kingdom to earth through us His people! It amazes me how much more God is showing them in their soaking time, after the lesson! We are praising God for the great things He is doing!